Public Parking is available in the Lincoln Center lot at the corner of Mulberry and Meldrum as well as the Mulberry Pool lot just west of the Lincoln Center. 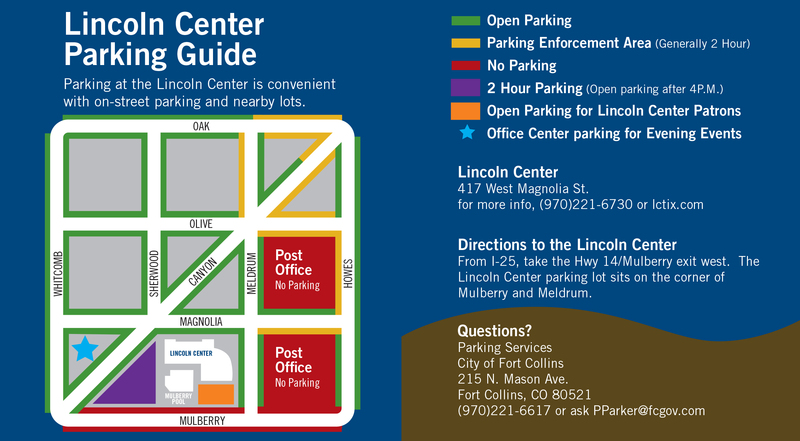 Please see the following map for locations of parking in proximity to the Lincoln Center. Please note that signed lots East of the Lincoln Center that are posted as NO PARKING are strongly enforced and those in violation will be towed. 462 on-street parking spots are available north of Mulberry Street within a two-block walk of the center. Additional parking is available at Lincoln Office Center for all Lincoln Center-presented shows. This includes any show that is listed in our 2016-17 season brochure. The extra spaces, located across the street to the west at 419 Canyon Avenue, are available for Lincoln Center patrons for the duration of each performance. During these shows, look for posted signs denoting the availability of parking in the Lincoln Office Center lot. We thank Blue Ocean Enterprises for sponsoring this parking agreement.